Why Buy A La gourmet Shogun Cookware? Since the inception La gourmet was built on the twin core principles of ‘Conserve Energy’ & ‘Healthy Living’.Shogun by La gourmet gives you the Assurance of Safety & a guarantee of a finely crafted cookware that provides convenience & healthy cooking. 2nd layer : Wet- in-wet coating reinforced with Marble resistant particles. 5th layer : Cast aluminium core provides excellent thermal conductivity and heat distribution. 6th layer : High heat resistant exterior coating. i) ENERGY SAVING – the excellent heat conductivity of the cookware reduces the amount of time & energy needed to cook. i) Tritanium Mega from Switzerland meets the highest SAFETY STANDARDS and QUALITY ASSURANCE. The Tritanium mega is produced by the biggest Swiss non-stick manufacturer. SPECIALLY DESIGNED THICK GAUGED CAST ALUMINIUM , This ensures an excellent conduction of heat & helps to avoid warping & other issues . CLEAN THE COOKWARE , Please clean the cookware thoroughly with dish drop & a non-scratch sponge. COAT THE COOKWARE , Coat the cookware with some cooking oil & season over low heat for a few minute switch off flame. Set it cook & wipe clean with kitchen towel. The cookware is ready for use . LOW TO MEDIUM HEAT/FLAME, The die-cast body of Shogun non-stick cookware has great heat conductivity, so please use low to medium heat. Start with medium flame & turn to low flame once cookware is hot. OVERHEATING EMPTY COOKWARE , Do not overheat an empty cookware over high flames as it can cause damage to the non-stick coating over a period time. Just heat & cook immediately. For stubborn stains or burnt food please put some water & dish drop inside the cookware & boil on small flame to loosen stubborn stains. Remove, wash clean & dry. Always clean the exterior of the cookware with dish drop & non-scratch sponge. If stains is on the exterior of cookware was immediately. Do not burn the stain over the flame as this will cause the stain to be infused into the exterior cookware & will be difficult to remove. However this will not influence the performance of your cookware . This cookware is warranted against any manufacturer’s defect for 2 years. 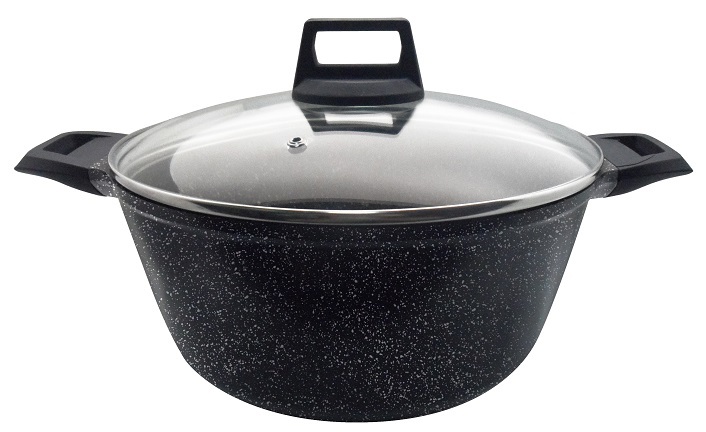 This does not cover against scratches, blisters of the non-stick due to persistent high heat & aggressive cooking. Normal wear & tear on the non-stick is also not covered.